In the Broncos’ recent seasons, it’s been all too easy to find the team’s Achilles’ heel: the offensive line. Even in their Super Bowl 50 season, the offensive line failed to effectively protect an aging Peyton Manning, and every subsequent quarterback since his retirement has faced the same inconsistent protection. 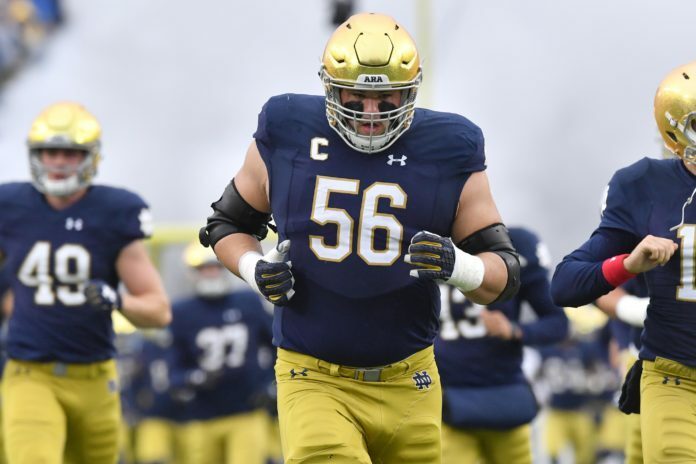 Despite the seemingly endless turnover on the problematic line, the Broncos are on the cusp of turning the team’s greatest weakness into one of its greatest strengths — because they may have the opportunity to draft the best offensive line prospect in recent memory: Notre Dame’s Quenton Nelson. As a prospect, Nelson’s credentials speak for themselves. A three-year starter and a unanimous All-American selection in 2017, Nelson is regarded as the best guard prospect to enter the draft since Larry Allen in 1994. According to NFL.com’s scouting report on Nelson, he projects to be as impactful of a player as Allen himself. Guards are rarely selected in the top five of the NFL draft, but Nelson is a special case. Not only are some draft experts calling him the best prospect in the class, some are going as far as to say he’s the best guard prospect to ever enter the draft. Nelson excels in run blocking, using brute force and powerful hips to consistently move any target out of the way. Nelson’s sound mechanics have also transitioned well into pass-blocking, as Notre Dame’s quarterbacks rarely faced interior pressure with Nelson lined up at left guard. The best part about linking the Broncos to Nelson is that they might not even need to select him with the fifth overall pick. As the race for draft position heats up to select one of the quarterbacks in this draft, the Broncos always have the option to trade down with a team like the Buffalo Bills, who many believe are trying to trade up in an attempt to select Josh Allen. To do so, the Bills would likely need to to surrender both of their first-round draft picks (nos. 12 and 22) and quite possibly a third or fourth round pick as well. The Broncos could then use all of that added draft ammunition to trade back up to select Nelson, while also having extra draft picks to address other holes on the roster. Should the Broncos select Nelson in the upcoming, they could finally solidify their entire offensive line into one of the NFL’s best. Nelson would start immediately next to center Matt Paradis and on the other side from Ron Leary, last offseason’s marquee addition. 2017 first round selection Garett Bolles would continue his growth at left tackle, while recently acquired tackle Jared Veldheer would command the right tackle position. The Broncos could then keep guards Max Garcia and Connor McGovern as depth players for the interior of the Broncos’ line, while tackle Menelik Watson could function as a “swing” tackle; capable of filling in at either tackle position in case of injury. Using the draft to build their offensive line was a strategy most recently used by the Dallas Cowboys, who now possess one of the best offensive lines in the NFL — despite the fact that Broncos plucked Leary from it one year ago. The Broncos aren’t too far off from possessing a top-tier offensive line unit of their own. While Nelson wouldn’t be the exciting pick that Broncos fans are hoping for, adding him may be the safest, most impactful — and therefore smartest — pick there Broncos could make.